So the Royal College of Physicians announces that in their opinion e-cigarettes are a remarkably effective smoking cessation device. You would imagine there would be a sigh of relief amongst the various governing bodies? An unbiased organisation, highly regarded in the medical world has made a pronouncement that should please everybody? So, a trio of pubs up in Scotland has decided to stop allowing Vapers to Vape indoors in them. They’ve cited stinky vape as the reason – some of their regulars aren’t keen on the pong off some of the Vapers folks have been using…. Thursday was a good day if you’re an advocate of e-cigarettes. An article published today in the Leicester Mercury highlights just how nasty and intolerant a world self-serving tobacco controllers have created for us. A Leicester City fan has been banned for two home games due to smoking an e-cigarette in the stands. It’s always nice to put finger to key and put some thoughts out into the virtual world isn’t it? I could, and often have, gone on for quite some length about a particular topic, but what good does it actually do? After all, I’m only “speaking” to like-minded folk right…? The publication by the Royal College of Physicians of a report “Nicotine without Smoke: Tobacco Harm Reduction” approbating the use of e-cigarettes as a route out of smoking conventional cigarettes affirms a finding that has been highlighted by researchers for a number of years now. The well respected Royal College of Physicians has done their homework. They have released a 206 page reportencouraging the use of e-cigarettes as another choice for smokers. Last year, Public Health England released their evidence as well. They have made tremendous progress in the tobacco harm reduction and public health field…. Imagine a time and place where the leading cause of cancer death was consumer consumption patterns, and where innovative technology was developed that allowed these consumers to change their behaviors to something greatly less hazardous. This new technology actually gave them something they preferred and that even cost them less than sticking with the old, deadly alternative…. 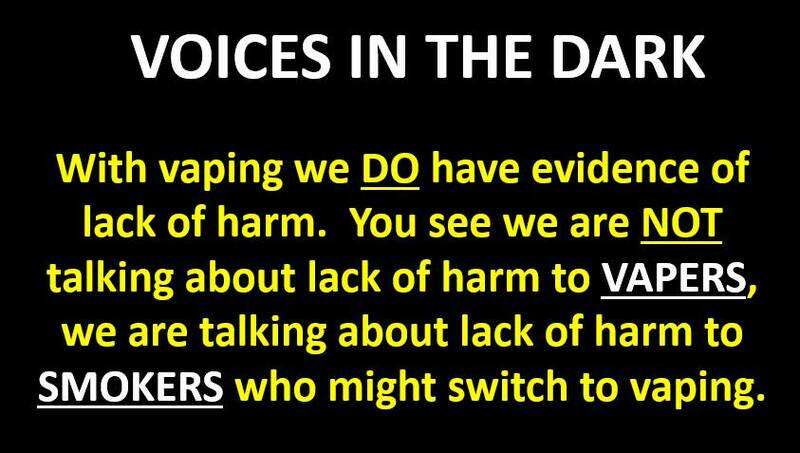 In just over two weeks, 20 May will be a big day for smokers and vapers – but I wonder how many know it. From that day, EU regulations in the form of the European Tobacco Products Directive will limit the strength of e-cigarette fluid and restrict bottle sizes to a measly 10ml. Tank capacity – i.e. the amount of fluid an e-cigarette can hold – will be limited to 2ml. There’s much excitement about Chris Bowen’s tobacco excise black hole. As breathlessly reported by Laurie Oakes last night, the Coalition is pinching Labor’s plan to slug smokers an extra 12.5 per cent excise per year until 2020, but Treasury estimates over the next decade it will rake in just $28.2 billion to Labor’s and the Parliamentary Budget Office’s estimate of $47.8 billion. In Australia, e-cigarettes containing nicotine are prohibited. Most Australian health organisations such as the National Heart Foundation, Cancer Council Australia and the Australian Medical Association take a very risk-averse approach based on potential harms. They say e-cigarettes could be a gateway to smoking for non-smokers….. The 2017 Agriculture Appropriations Bill may not seem like a stirring piece of legislation to most, but it raised quite a few eyebrows last week as it passed through a House subcommittee with a key amendment—one that aims to spare the vast majority of electronic cigarettes from impending federal regulations. According to an information published by ECigIntelligence, British American Tobacco could have afforded Ten Motives, one of the most important independent e-cigarette manufacturer in the UK. Is there still hope for Spanish online retailers?